FSA withdrawal letters and information for parents will soon arrive to your school via courier, and should be distributed to the parents of Grade 4 and 7 students. If you find that you need additional handouts, please contact reception@surreyteachers.org. 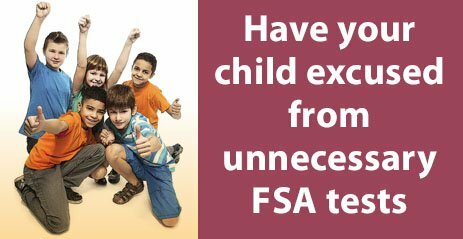 The provincial government has been administering the FSAs to all students in Grades 4 and 7 since 2000. The BCTF’s stance on this test is that it does not help students learn or teachers teach. It takes valuable time and much needed resources away from the classroom learning and undermines the ability to provide meaningful learning experiences for all students. The FSA results are misused by a private organization to rank schools based on a very narrow measure. The tests do not result in any additional funding or support for students. © 2018 Surrey Teachers' Association. All rights reserved.